Broad Minded City is a full-feature documentary film about Urban Planning, Design and Architecture exploring the relationship between Frank Lloyd Wright’s urban model, “Broadacre City,” and today’s urban sprawl. It focuses on the current state of cities moving forward toward a sustainable future. It features interviews with architects, urban theorists, designers, city planners, artists, community activists and transportation experts. These interviews took place in different cities that are going through transformations of livability, sustainability and quality of life issues by grassroots campaigning, community-based policies, environmental impact, accountability, transparency and a better understanding of Broadacre City. Cities like Los Angeles, Detroit, Phoenix, and other places that are especially determined and characterized by urban sprawl are rethinking their present urban model. This film also focuses on the greater Los Angeles area—34,000 square miles of sprawl looking for its center—as a way to understand the geopolitical/social built environment that has influenced other cities in the past with suburbia. How will Los Angeles go through the transition of communities, mobility, environmental impact, identity and the role of architecture and design? Frank Lloyd Wright, considered the greatest American architect, developed the term and the philosophy of “Organic Architecture” that was reflective of his life’s work, and influenced the world in his approach toward urban planning, design and architecture. The interviews with former associates of Frank Lloyd Wright, including Eric Lloyd Wright, his grandson, elucidate the concept of Broadacre City, organic architecture, their relationships with Frank Lloyd Wright and their criticisms of today’s architecture and city planning. 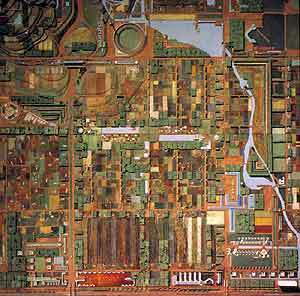 Model of Broadacre City (1932-1958) by Frank Lloyd Wright. Courtesy of the Frank Lloyd Wright Foundation.